Wet Floor Sign Guidelines | Branch & Dhillon, P.C.Branch & Dhillon, P.C. 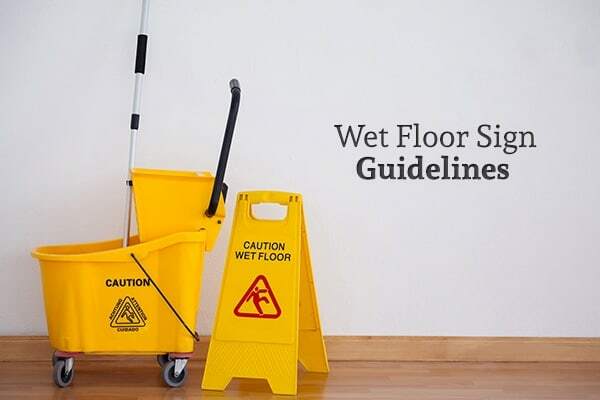 Wet Floor Sign Guidelines: Do I Have a Slip & Fall Case? If you slip and fall on a wet floor, it can lead to serious injuries. These kinds of injuries are unfortunately common on commercial properties. When you get injured in a slip and fall accident, you may wonder if you have the right to compensation for your injuries. This question often revolves around whether or not there was a wet floor sign present. However, it’s important to know that the presence of a wet floor sign does not always mean that a property owner isn’t liable for your injuries. Before you assume that you don’t deserve compensation for your slip and fall accident injuries, read the information below. Even if you can’t prove one of the above, you could still have a case. It’s important to consult with a personal injury attorney after you slip on a spill or leak before assuming that you don’t have a case. When you see a wet floor sign, you’re likely to make a wide arc around it so that you can avoid slipping. However, if you try to walk around the wet spot but it occupies a significant amount of space, you still may slip on it. If you made a reasonable assumption that you were far from the spill because you were far from the sign but you still slipped, you may have a case. In an area with tables or other obstructions that you must navigate through, it’s possible for a sign to be blocked from view. A wet floor sign should be visible from any direction that you might approach the wet spot from. If you could not see the sign when you slipped and fell, you may have a case. A wet floor sign should only be used to warn people about a wet floor. If there are loose tiles or other tripping hazards, a property owner may just stick a wet floor sign there because it’s convenient. However, this will not adequately warn you of the actual danger. After all, if you see a wet floor sign but don’t see any wetness, you may not see anything to avoid and therefore fall and get injured. If you slip on a wet floor, you need to document the circumstances. This will prevent a court battle from being just your word against the property owner’s. After you slip and fall, take pictures to document whether there was a wet floor sign in the area, and – if there was – whether it was placed appropriately. If there were any eyewitnesses to the slip and fall, ask if you could record their statements. They may be witnesses to the fact that there was no sign, it was not placed appropriately, no one was guarding the spill, and/or no one was going to fetch a wet floor sign. You should then immediately visit a medical professional to document any injuries you may have sustained. There are many injuries you can sustain after falling that may not be immediately apparent to you, so it’s important to get examined instead of assuming that you’re fine. It’s also important that you consult with a personal injury attorney before accepting any settlement from the property or business owner. An experienced personal injury lawyer will be able to help you determine if they’re offering you a fair settlement. If you were injured in a wet floor slip and fall accident – even if there was a wet floor sign out – contact the law offices of Branch & Dhillon, P.C. Their expert personal injury attorneys will help you determine if you have a case and will get you the compensation that you deserve for your injuries. Call them today to schedule your free consultation.